If you like caramel, you are going to fall in love with this easy and flavorful Caramel Mousse Filling for your cakes and cupcakes! 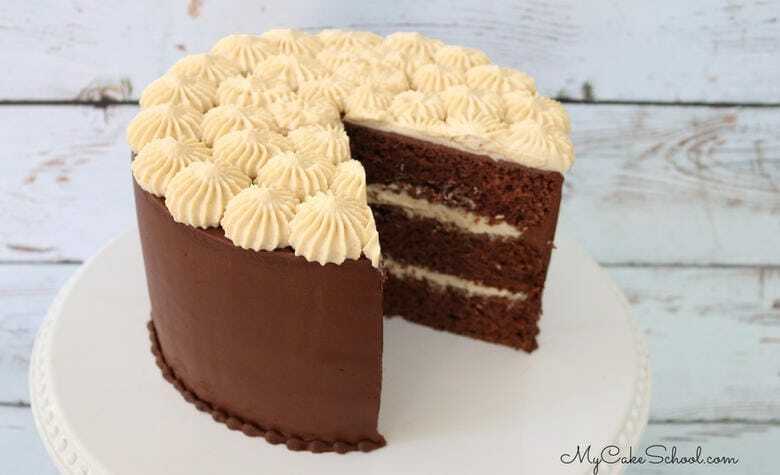 The caramel flavor and consistency is so light and luscious, and we recently used it as a filling and topping for our homemade Classic Chocolate Cake with fantastic results! It is a new favorite filling option for sure, and one that was long overdue. How do you make Caramel Mousse Filling? 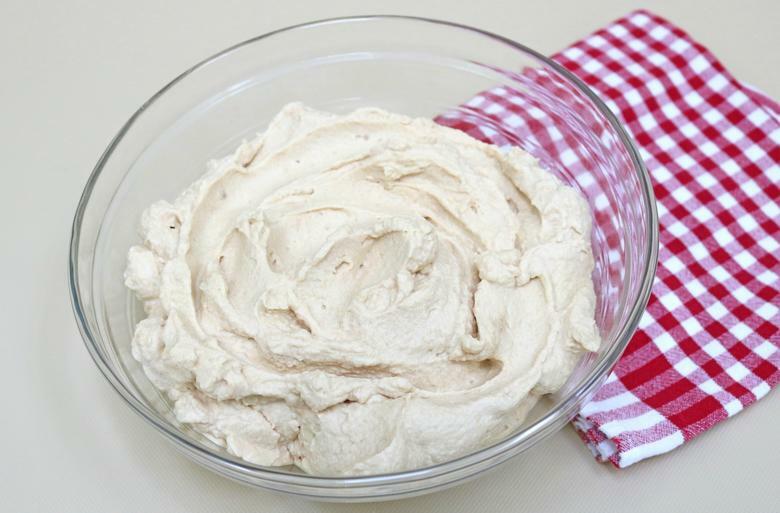 This delicious filling is easier than you think! We started off by whipping up some cream! Now that the whipped cream is ready, we’re on to the delicious caramel. Heavy cream and caramel chips are the key players! In this case, we actually used salted caramel chips (SO good), but plain caramel chips would work well also. 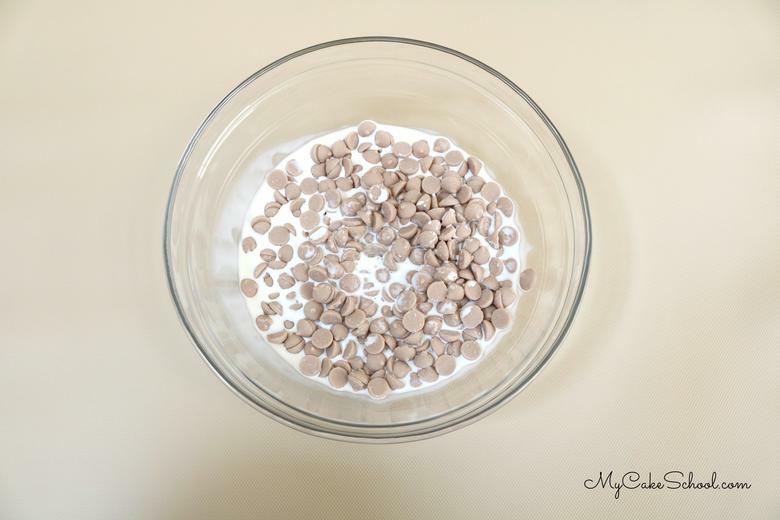 Next, we combined the caramel chips and cream in a microwave-safe bowl, and heated in the microwave in small increments until melted. We gently folded the caramel into the whipped cream until light, luscious, and well combined! That’s all there is to it! Spread this deliciousness between layers of your favorite chocolate or caramel cakes…or really, spice cake would be fabulous too! 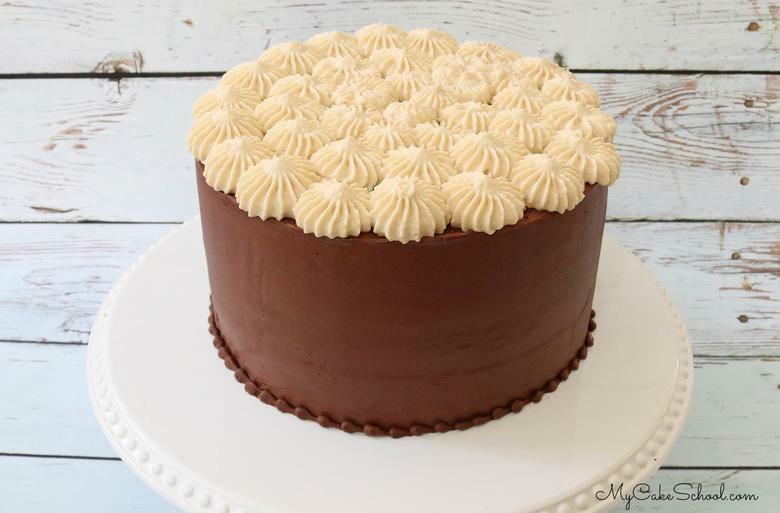 For this post, we chose our decadent classic chocolate cake, and frosted with ganache frosting- YUM! After frosting the cake with chocolate ganache (a 2:1 ratio of semi-sweet chocolate to cream), we topped it off with piped stars of caramel mousse. While it holds up to piping perfectly, it’s probably a bit too soft for spreading over the entire cake. That’ll be an experiment for another time ;0) — Although, it would work well on cupcakes! We hope that you try this amazing caramel filling! It’s definitely a new favorite of ours! For the 8 inch cake pictured above, we created ganache frosting using a 2:1 ratio of chocolate to cream. In this case, we used 20 oz Ghirardelli Semi-Sweet Mini Chips, to 10 oz heavy cream. To make the ganache, we placed the chocolate and cream in a microwave-safe bowl, heated for one minute, stirred, heated for 30 more seconds, stirred until it came together with no unmelted pieces. (Repeat heating in small increments and stirring if needed until it’s ready). The ganache thickens as it cools. Then, we simply frosted and smoothed with a bench scraper. If you’d like to further smooth the ganache, you can chill it just until firm, and glide over it with a heated metal bench scraper (or spatula). Don’t miss our full collection of favorite cake and frosting recipes in our Cake Recipes Section! We hope that you’ll stop by our Recipes Section for more tried and true cake and frosting recipes! 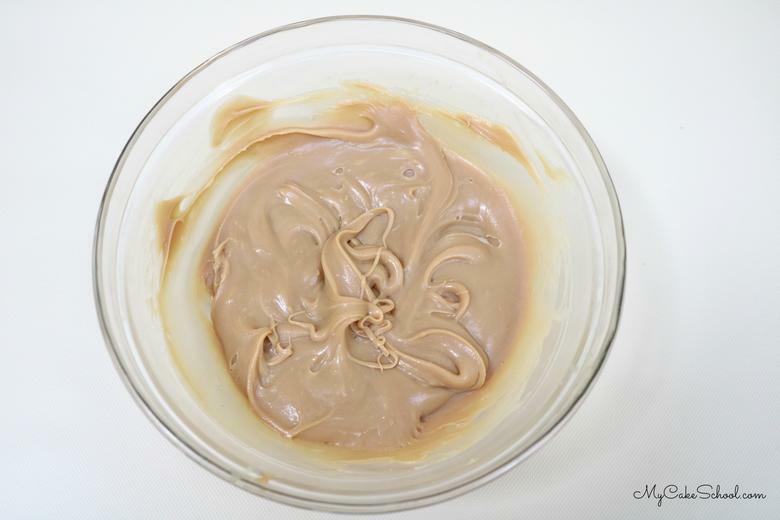 This light and delicious Caramel Mousse Filling is amazing for your cakes and cupcakes! We love it with chocolate cakes as well as caramel! Enjoy! Chill the bowl and beaters in the freezer at least 15 minutes before whipping the heavy cream. Whip 1 1/4 cups heavy cream to the stiff peak stage (when you pull the beaters out of the bowl the peaks will hold firm and not curl over). Cover the bowl and refrigerate the whipped cream while preparing the caramel. 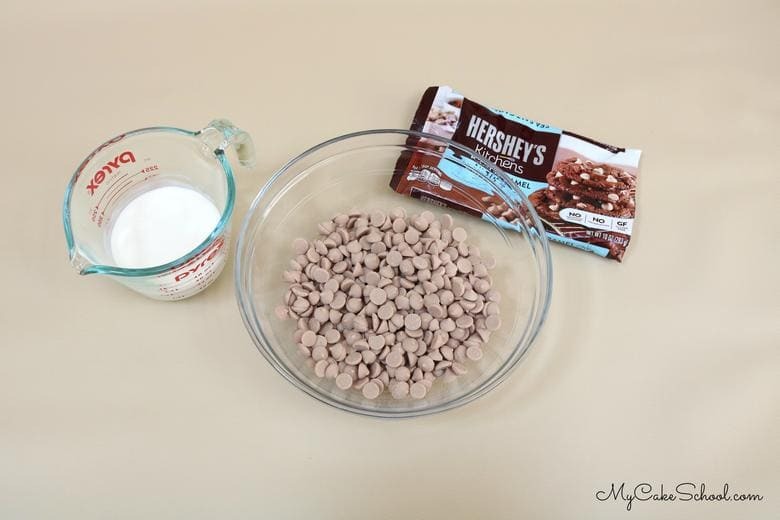 To a microwave safe bowl add the bag of Hershey's Salted Caramel Chips (or your caramel chips of choice) and 1/2 cup heavy cream. Microwave 20 seconds and stir, another 20 seconds, stir and a final 10 seconds and stir until the chips are completely melted. Be careful not to over microwave the chips. The caramel needs to cool down completely before folding into the whipped cream. 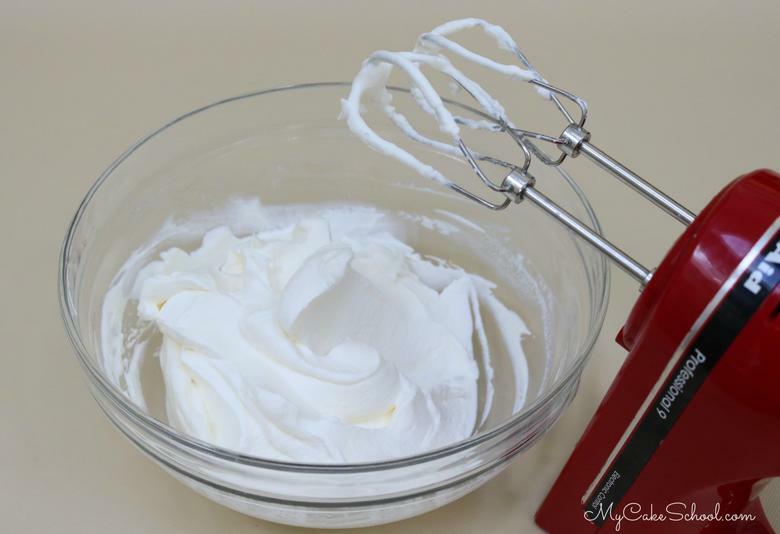 If it is added while still warm the whipped cream will deflate. 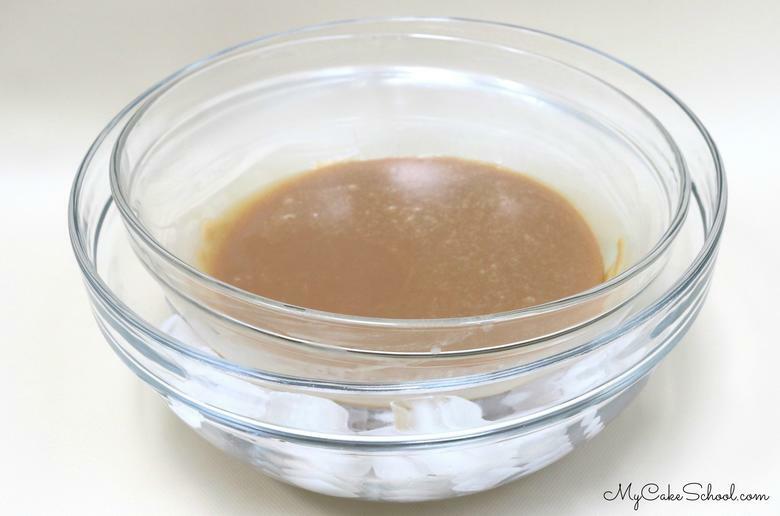 To speed up the cooling process, place the bowl with the caramel into a larger bowl containing ice. This should cool it down in about 10 minutes. 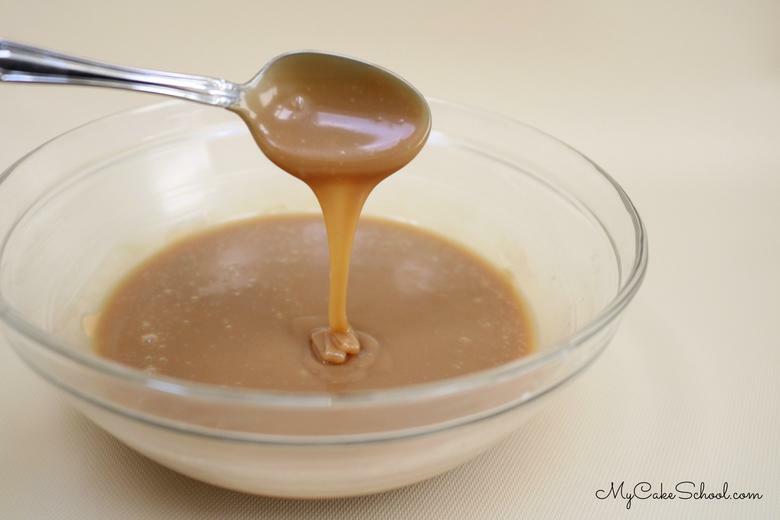 Stir the caramel frequently while it is cooling. 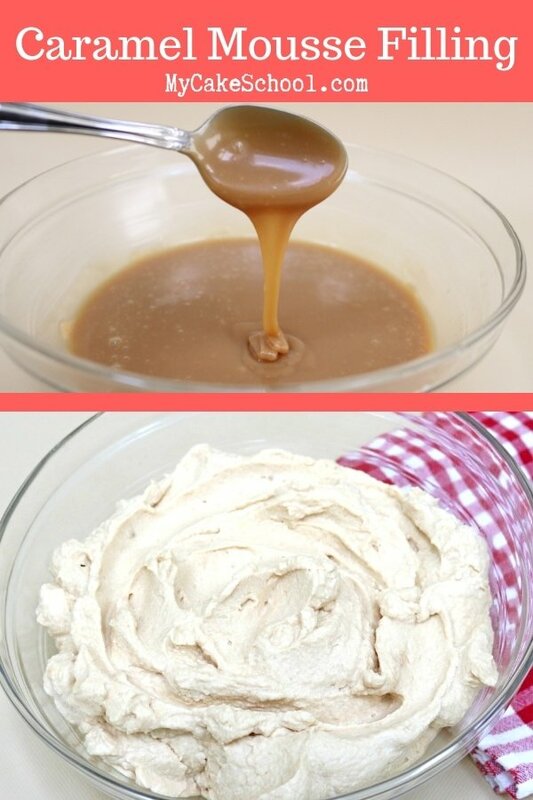 Fold the caramel into the whipped cream and it is ready to use. Since it is whipped cream does it have to be refrigerated ?? Or because of the caramel it holds ok ? Hi Vero, It does need to be refrigerated. You can take your cake out of the refrigerator 1 1/2 to 2 hours before serving to warm up a bit before serving. Looks yummmm. But I haven’t seen caremel chips here in london 😩. Could homemade caramel sauce be used in place of the chips? Hi Shirley, I have not tried using caramel sauce, but if it is thick enough it could possibly work to fold it into the whipped cream. Let us know if you decide to give it a try. Thank you for a wonderful recipe! I made this for my daughter’s birthday cake and it was delicious and beautiful! Hi Priya, Thank you for your nice comments, we are very happy you liked Caramel Mousse Filling!